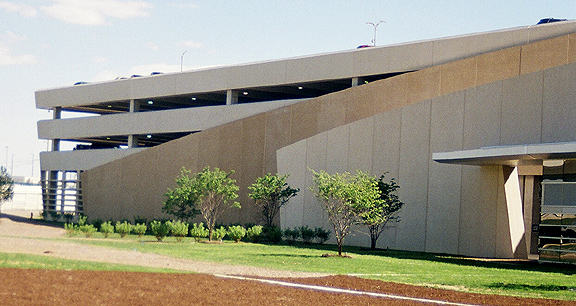 Project obstacles and solutions: The new parking garage at the Indianapolis International Airport midfield terminal is a five level, 7,000 car structure. The 100,000 yards of concrete were specified to have high tolerances for maximum structural strength. The reinforcing steel also needed to be protected from long-term corrosion. IMI mixed micro-silica fume into the concrete batch. Silica fume is an industrial waste produced when silicon or ferrosilicon are used to make microchips. It is a finer particle than Portland Cement and can be used as a supplementary cementitious material. The result is a tighter pore in the concrete that increases strength and keeps water and chemical penetration of the finished product to a minimum. This keeps post-pour chemical corrosion of incorporated steel in check. Beyond the strength factors, the concrete used in the parking garage was a green product. Recycling micro-silica fume in the concrete kept 5 million lbs. of industrial waste from the landfill in this project alone. For more information on green concrete, click here.